WEDNESDAY, DECEM BER 16, 2009 AT 6:15 P.M.
5. Discussion, consideration and possible action to adopt Resolution No. 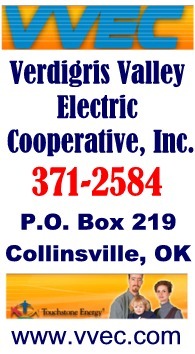 2009-21 approving the incurring of indebtedness by the Collinsville Municipal Authority; waiving competitive bidding thereon; and declaring an emergency. -- the item (sewer project funding to the west to Hyw 20/75) was not acted on as all the paperwork was not quite ready. It will likely be back on the agenda for Monday Dec. 21. 6. Discussion, consideration and possible action on contract with Retail Attractions, LLC. -- No action was taken. Rickey Hayes provided status on economic development activities he has done on behalf of Collinsville. He has been submitting a log of those activities monthly with his company's invoice to the city but the commissioners had not been seeing that detail. Hayes commented on seperal specific retailers with new deals pending in Collinsville with the city's sewer committment (& Quick Trip's committment) as being key to the future develpment and sales tax revenue from the Highway 20 corridor to the west. MONDAY, DECEMBER 16, 2009 AT 6:15 P.M.
4. Discussion, consideration and possible action to adopt Resolution No. 2009-22 authorizing the sale, issuance and delivery of bonds of the Authority; authorizing the sale thereof at a discount; and waiving competitive bidding thereon.